Co-working is clearly having a moment. WeWork has launched in Northern Liberties, with a sister location on Walnut St slated to open soon. Pipeline and Industrious recently swung open their doors in Center City. New York's The Yard will open a Philly outpost in the fall. They all join the dozens of already-active co-working spaces currently operating within city limits. 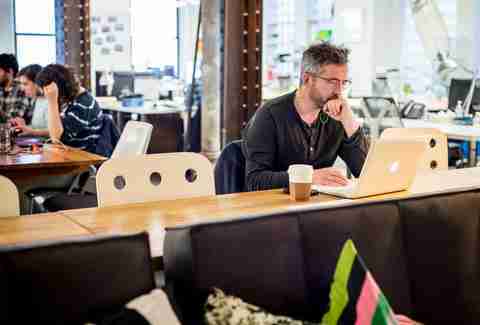 Independent contractors, frequent travelers, and freelancers looking to escape the isolation of working in cafes and the distractions of working at home seek out these shared office arrangements. It’s a smart choice for people who want to make friends, boost their professional network, or give their day some much-needed structure. "We're not a bar or a coffee shop, but we serve a lot of the same function." But like colleges or restaurants, each co-working space is different. They may have differing goals, divergent philosophies, and totally opposite atmospheres. Some places are the equivalent of khakis, loafers, and espresso. Others are hoodies, flip-flops, and a beer. Old City’s Indy Hall has both the eager friendliness of a puppy and the chummy camaraderie of an arts collective. Center City’s CultureWorks operates on a senior-year-finals-week kind of vibe: members are focused and independent, less interested in community and more interested in getting their work done. Most places are somewhere in the middle, situated in cool neighborhoods with nice views and free coffee. So it shouldn’t be a surprise when I approached three of the leading co-working spaces and asked them why our city is undergoing such a monumental a co-working boom, I got three different answers. Sam Abrams, Indy Hall’s den mother and self-described tummler -- a Yiddish word meaning “one who makes things happen” -- credits the co-working boom to people craving a close-knit creative community. “Working by yourself gets really lonely. That's the reason Indy Hall exists, because [founder] Alex [Hillman] and a few of his friends were lonely, and they thought there has to be other people like us who want to make Philly a better place by working together." 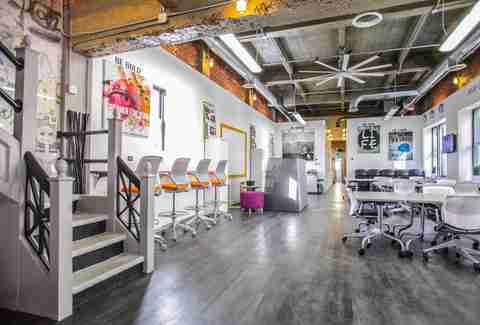 With over 300 members, Indy Hall is at the forefront of Philly’s co-working scene. Started back in 2007, it was the first of its kind, acting as a vibrant home to artists, techies, accountants, lawyers, and everything in between. Today they've built a real community -- their dedicated Slack channel buzzes as members gab about everything from professional opportunities, happy hour plans, to last night’s Game of Thrones episode. They throw art shows featuring works by their members and have indie rock songs playing on the overhead speakers. “We have three promises here: take care of yourself, take care of each other, and take care of this place,” Abrams said. It’s basically the grown up version of a clubhouse, if it had fast Wi-Fi and a fridge full of beer. “At the end of the day, people are looking for a place to get their work done that's not their living room and not a coffee shop,” said Liz Sytsma, Associate Director of CultureWorks. 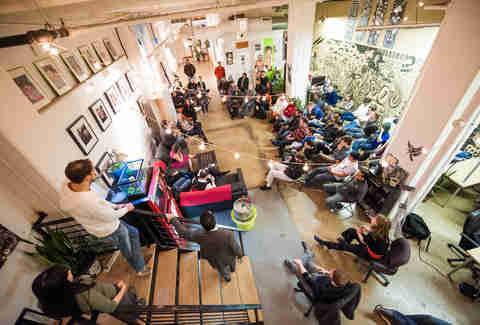 Situated in a suite in the Philadelphia Building, CultureWorks has a rotating roster of about 150 current members. Unlike Indy Hall, they’re more than just a space to work in. On the business level, they offer a range of services to help manage and direct the member organizations, both big and small. 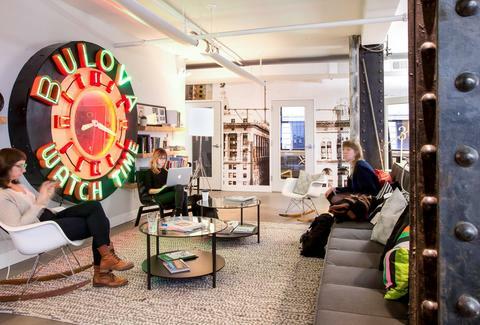 For them, offering co-working space is one piece in the larger business management puzzle. Anna Goldfarb is a writer in Philadelphia and she is always excited at the idea of free coffee. Follow her @AnnaGoldfarb on Twitter and Instagram.